News and Announcements – Page 2 – ME&A Inc.
JOB DESCRIPTION: The incumbent in the position of hydromorphologist will serve under the general direction of the ASPIRED Project Chief of Party. As part of this Statement of Work, activities will be implemented to provide technical expertise towards improving Armenia’s legislation related to the assessment of self-purification capacity of rivers in Armenia. ASPIRED will establish a working group to work in collaboration with the Government of Armenia. Other technical/hydrological assistance relevant to the implementation of this assignment. Other tasks related to this Assignment. Interim reports on the activities and findings of regular field observations, in accordance with the approved schedule. The report shall include the dynamics of change in hydromorphological parameters, which will be used in the selected method for assessment of self-purification capacity of rivers. A set of recommendations on hydromorphological requirements for endangered species exposed to anthropogenic impacts. Final technical input for development of the method for assessment of self-purification capacity of rivers in Armenia. All documents shall be submitted in electronic version in MS Word, Excel and/or Power Point Presentation formats. – Knowledge of the English language is highly desirable. APPLICATION PROCEDURES: Interested and qualified candidates should send their CVs to: aspired@engl.com. Please refer to the specific position title in the subject line. Only short-listed candidates will be contacted for an interview. No phone calls, please. Please clearly mention in your application letter that you learned of this job opportunity through Career Center and mention the URL of its website – www.careercenter.am, Thanks. ABOUT COMPANY: The Advanced Science and Partnerships for Integrated Resource Development (ASPIRED) Project funded by the US Agency for International Development (USAID) is a 5-year initiative (2015-2020) designed to support sustainable management of water resources in the Ararat Valley through the use of science, innovation and partnerships. The Project is implemented by the Armenian Branch of Mendez England & Associates. ABOUT: Within the framework of the Project, the ASPIRED supports the Government of Armenia (GOA) in improving water sector legislation. Under this task, the Project will collaborate with the Ministry of Nature Protection (MNP) of Armenia in implementing priority measures for effective management of water resources in the Ararat Basin Management Areas of Armenia, as stipulated in the Government Decision N: 338-N, dated March 31, 2016 on approving the 2016-2021 Management Plan and Priority Measures towards effective management of the Ararat Basin Management Area. JOB DESCRIPTION: The incumbent in the position of Hydrobiologist will serve under the general direction of the ASPIRED Project Chief of Party. As part of this Statement of Work, activities will be implemented to provide technical expertise towards improving Armenia’s legislation related to the assessment of self-purification capacity of rivers in Armenia. ASPIRED will establish a working group to work in collaboration with the Government of Armenia. – Participate in stakeholder presentations and discussions on assessment of self-purification capacity of rivers of the Ararat Basin Management Area of Armenia, hosted by the MNP. – Other tasks related to this Assignment. Interim reports on the activities and findings of regular field observations, in accordance with the approved schedule. The report shall include the dynamics of change in hydrobiological parameters, which will be used in the selected method for assessment of self-purification capacity of rivers. A set of recommendations on hydrobiological requirements for endangered species exposed to anthropogenic impacts, while identifying the maximum allowable concentration of pollutants for the specific sections of the rivers. ABOUT: Within the framework of the Project, the ASPIRED supports the Government of Armenia (GOA) in improving water sector legislation. Under this task, the Project will collaborate with the Ministry of Nature Protection (MNP) of Armenia in implementing priority measures for effective management of water resources in the Ararat Basin Management Areas of Armenia, as stipulated in the Government Decree N: 338-N, dated March 31, 2016 on approving the 2016-2021 Management Plan and Priority Measures towards effective management of the Ararat Basin Management Area. 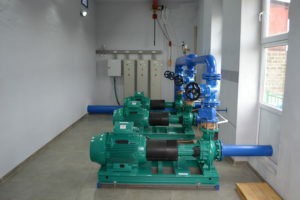 Advanced Science & Partnerships for Integrated Resource Development (ASPRIED) Project is soliciting Bids for the supply of PE pipes and fittings and provision of PE pipe welding and pipeline mounting work as well as construction of pumping and chlorination stations under a broader project on improvement of water-supply in Yeghegnut Village of Armavir Region. Bids must be submitted no later than 17:00, Yerevan Time, on Tuesday, November 27, 2018. On Tuesday, November 20, 2018 at 16:30, a pre-bid meeting with interested Bidders will be held at the ASPIRED Project office (address: CITADEL Business Center, 105/1, Teryan Street, Suite 204, Yerevan) to answer questions of potential Bidders and provide clarifications regarding the Bid. ASPIRED is soliciting Bids for the supply of PE pipes and fittings and provision of PE pipe welding and pipeline mounting work as well as construction of pumping and chlorination stations under a broader project on improvement of water-supply in Aratashen Village of Armavir Region. Bids must be submitted no later than 17:00, Yerevan Time, on Tuesday, November 27, 2018. On Tuesday, November 20, 2018 at 15:00, a pre-bid meeting with interested Bidders will be held at the ASPIRED Project office (address: CITADEL Business Center, 105/1, Teryan Street, Suite 204, Yerevan) to answer questions of potential Bidders and provide clarifications regarding the Bid. 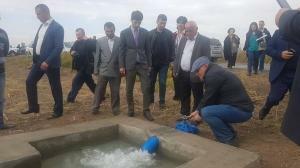 On October 22, the United States Agency for International Development (USAID), the Fund for Armenian Relief, and the Small and Medium Entrepreneurship Development National Center of Armenia (SME DNC) marked the successful completion of the joint irrigation project in Sayat-Nova community in Ararat province. USAID Armenia Mission Director Deborah Grieser, the Governor of Ararat province, Garik Sargsyan, and Sayat-Nova residents attended the opening event. USAID’s studies show that the depletion of water in the Ararat Valley threatens the sustainability of the country’s strategic groundwater resources. Due to the overexploitation of the valley’s groundwater reserves, more than 30 communities in the region are experiencing a shortage of drinking and irrigation water. Lack of irrigation water hurts farmers, negatively impacting the socio-economic situation of the rural communities and leading to migration of the population from rural communities. In 2017, USAID’s Advanced Science and Partnerships for Integrated Resource Development (ASPIRED) project signed a partnership agreement with the Fund for Armenian Relief, the Partnerships for Rural Prosperity project, which is funded by USAID and implemented by SME DNC, and the community of Sayat-Nova for the implementation of an irrigation improvement project for the community. The new system provides more affordable irrigation services and more efficient groundwater use to irrigate 60 hectares of community land by reusing the outlet water from the Masis Dzuk fishery near Sayat-Nova rather than dumping it into the drainage network. Through the public-private partnership between the community and Masis Dzuk, a new pumping station was built at the outlet section of the fishery and a new irrigation network was installed with durable polyethylene pipes. The laboratory analysis of the water’s quality proved that the outlet water from the fish farm can be safely used for the production of crops. In partnership with the Center for Agribusiness and Rural Development (CARD) Foundation, USAID also trained local beneficiaries on sustainable farming practices to ensure lasting results. “Water scarcity has a huge negative impact on food production in the region. The residents of Sayat-Nova should feel proud. 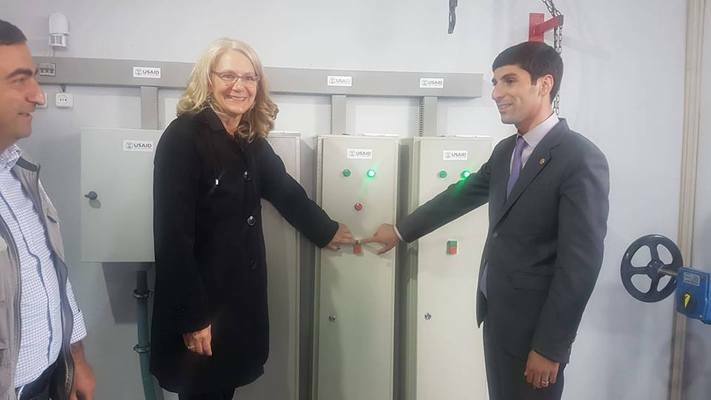 They are the second community to put in place this method of irrigation using water from a nearby fishery, and the first community that has applied this method for large scale irrigation,” USAID Mission Director Deborah Grieser said. “Due to this effort, the water use by the fishery will be more efficient, and the community will not require additional water be pumped from the ground to irrigate their fields, thus saving electricity and helping to reduce soil degradation,” she noted. Following the official opening of the pumping station, the USAID Mission Director, the Governor of Ararat and guests walked through the fields to meet with the land owners and to see the new irrigation system in use. Today, 252 people from 98 households will benefit from an opportunity to irrigate their farmlands that had been left idle for the last 15 years. The new irrigation system has a potential for expansion to cover up to 190 hectares of community land, benefiting 2,400 local residents. Sayat-Nova is the second community in the Ararat Valley after Hayanist where USAID, with the help of its partners, has implemented a project highlighting the secondary use of fish farm water as an alternative and environmentally sustainable solution. This approach can be effectively replicated by other communities in the region to address the valley’s shortage of irrigation water. – Compiling, reviewing and ensuring data inter-operability/homogeneity for the relevant data of the 7 meteorological stations in the Ararat Valley, namely Ararat, Artashat, Armavir, Urtsadzor, Ashtarak, Yerevan Agro, Yerevan Arabkir, as well as the Aragats high mountainous meteo-station. Providing time-series of the following data for 1961- 2016: (a) precipitation – in the form of snow and rain (daily); (b) monthly air temperature (maximum, minimum, average); (c) snow depth (daily); (d) density of snow cover (ten-day period); (e) wind direction and velocity (daily); and (f) relative and absolute air humidity (daily). – Identifying and filling the gaps in data-sets. – Analyzing the trends of changes in climatic elements, including in average, maximum and minimum air temperatures, precipitation, relative humidity and winds, based on the time-series of data for 1961-2016 from the above-mentioned eight meteorological stations in terms of baseline period (1961-1990) and analysis period (1991-2016). – Analyzing and assessing the climate change projections for Ararat Valley for 2030, 2070 and 2100, on monthly, seasonal and annual basis (against the average of 1961-1990), according to A2 and B2 emissions scenarios for the following parameters: (a) precipitation; (b) air temperature; and (c) natural river flow. – Providing a description on the methodology used for the climate change projections down-scaling, i.e. relevant global and regional climatic models applied and scenarios selected. ABOUT COMPANY: Mendez England & Associates is a consulting firm in Bethesda, Maryland, USA with nearly 30 years of experience in international development. The primary client of ME&A has been the US Agency for International Development (USAID). For more information about ME&A, please visit: http://www.mendezengland.com. ABOUT: The Advanced Science & Partnerships for Integrated Resource Development (ASPIRED) Project is a five-year initiative funded by the US Agency for International Development. The objective of the Project is to support sustainable water resource management and the sustainable practices of water users at the core of the water-energy nexus through the use of science, technology, innovation and partnership approaches. The goal is to reduce the rate of groundwater extraction in the Ararat Valley to sustainable levels. This announcement does not in any way obligate ME&A to award a contract or a purchase order. Bids must be submitted no later than 17:00, Yerevan Time, on August 31, 2018. Each bidder must submit one hard copy of the bid to USAID ASPIRED Project office at CITADEL Business Center, 105/1, Teryan Street, Suite 204, Yerevan. ME&A, Inc. (formerly Mendez England & Associates), the implementer of the USAID-funded Advanced Science & Partnerships for Integrated Resource Development (ASPRIED) Project, is soliciting proposals for repair of the self-flowing irrigation well and construction of an adjacent distribution (valve) chamber in Sipanik community of Ararat Marz. Proposals must be received no later than 17:00, Yerevan Time, on August 31, 2018. Offerors must submit one hard copy in Armenian of their Technical and Cost Proposals to ASPIRED Project office at CITADEL Business Center, 105/1, Teryan Street, Suite 204, Yerevan. On July 11, ASPIRED signed a Memorandum of Collaboration with the Sustainable Energy Development Fund (SEDF) based on their common interest in promoting the use of sustainable energy sources in Armenia. SEDF will provide technical assistance to the beneficiaries of the pilot projects initiated and/or co-financed by the ASPIRED project, which promote the use of solar technologies by the communities and fish-farms of the Ararat Valley.